Originally released back in 1998, Resident Evil 2 has since become a cult classic. Now just like a zombie, it is reborn as the remake of Resident Evil 2! This genre-defining masterpiece isn’t just Resident Evil 2 with prettier graphics; it’s a complete rebuild from the ground up, with a deeper narrative experience. Veteran players of the game won’t be able to use their prior knowledge of the game to finish this version, as in-game items (now revamped) and enemies won’t be in the same place as the previous game. The remake uses the new “RE Engine”, which supplies players with a fresh take on the classic horror survival game, equipped with immersive audio, 3D environments, an over-the-shoulder camera, realistic visuals and modernized controls. For those unfamiliar with the story of Resident Evil 2, the player joins rookie officer Leon Kennedy and college student Claire Redfield, who find themselves together after a disastrous outbreak in Raccoon City. The spreading virus infects the city’s population and turns them into deadly zombies, who want nothing but to kill. The remake features the Resident Evil series staples, like puzzle-solving gameplay and tense exploration. With both Leon and Claire having their own separate playable campaigns, players get the chance to see the story from contrasting and fun perspectives. Capcom’s Resident Evil 2 Remake is everything fans of the Resident Evil games series and the original Resident Evil 2 have been waiting for. So, what you waiting for? Re-enter the best open-world horror survival game today! 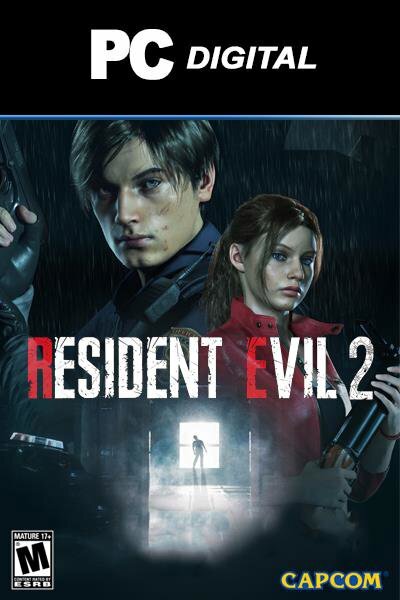 Livecards.co.uk makes buying Resident Evil 2 Remake for PC as easy as pie! All you need to do is fill in your email address, pick a payment method, complete the payment and voila! The code is yours.